Now through April 15, AppleInsider readers can enter to win a Fibaro Flood Sensor valued at $69.99. Fully compatible with Apple HomeKit, this sensor can notify you of water leaks and sudden changes in temperature to protect your home against possible water damage. We recently reviewed the wireless HomeKit sensor and found it to be a worthwhile addition to safeguard against leaks. 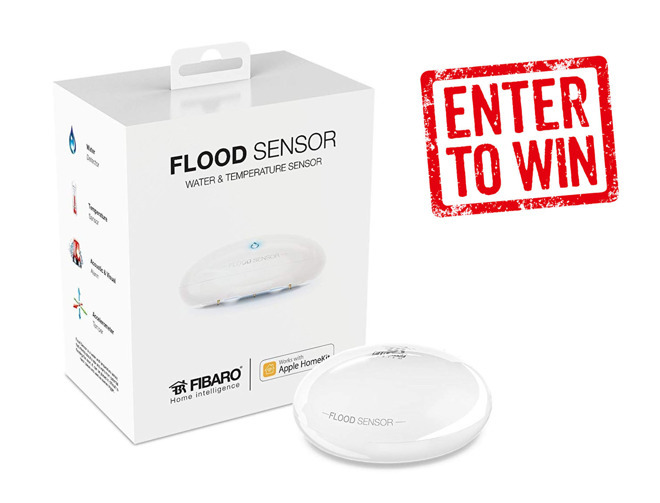 Ten lucky winners will each receive a Fibaro Flood Sensor with Apple HomeKit compatibility. Entering the giveaway is quick and easy. Simply retweet this tweet or subscribe to our YouTube channel using the widget below. You can also gain additional entries by following us on Instagram to view exclusive photos from Apple events. The entry period for this giveaway ends at 11:59 p.m. Pacific on April 15, and the winner will be announced here on April 16. Definitely check back to see if you've won. No purchase is necessary to enter and the sweepstakes is open to U.S. residents aged 18 years and older. Please note, contest entries will be verified upon selecting the winners. Don't want to wait for the giveaway to end? Amazon currently stocks the HomeKit-compatible Fibaro Flood Sensor for $69.99 with free shipping.